It’s been a wild and crazy ride for the fellas in World’s Finest, since their modest beginning as an acoustic duo in Portland, OR living rooms in 2011. With a songwriting style rooted in Americana, the band banks on their ability to transcend genres of all kinds. 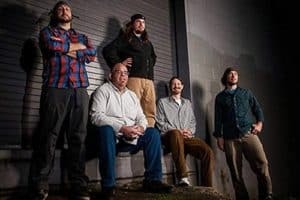 String-centric and bluegrass-inspired compositions seamlessly transition into 3-Dimensional Psytrance, Funk, and Dub soundscapes, leaving their audience with a full circle experience of emotion and dance. Their appreciation for punk and ska can be found peppered throughout their shows and albums, made evident by up-tempo, high-energy offerings, reminiscent of such classic acts as NOFX and Operation Ivy. Never happy to settle, Chris, Dan, Sean, Evan, and Mike continue to push through boundaries and challenge themselves, while hoping to inspire their listeners to expect the most out of what a band in the modern age can be capable of conjuring up.